Hair for wigs, hair pieces, hair extensions, hair replacements and other hair products for all human ethnicities, comes from 2 sources: Human Hair and Synthetic (man made) hair products. Hair Suppliers are found all over the world. The two main type of hair today are human hair and synthetic hair. Synthetic hair producers are often found throughout Asia. 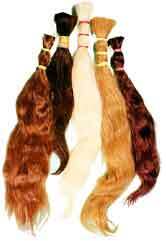 Human hair suppliers are found in their local regions and often take hair production and sales very seriously. European hair often comes from many parts of Russia and Europe. African Hair is imported from various parts of Africa and often Asia. Asian hair when processed properly can be made to look like hair from various ethnicities. Indian and South American hair is also very popular and comes from these regions.